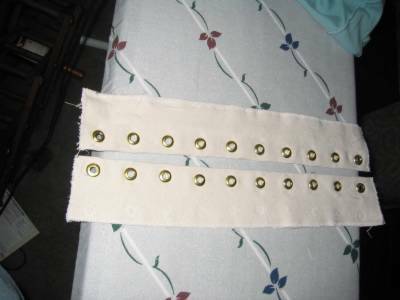 My temporary corset lacings (made of white denim and Dritz grommets)--I simply baste these on to whatever corsets/bodices I experiment with now and in the future to see what they look like laced without having to poke possibly-wrong holes into my garment before I'm ready. Yay! Tonight Jack, the seamripper, and I got to be great friends. I have never seam ripped so much. 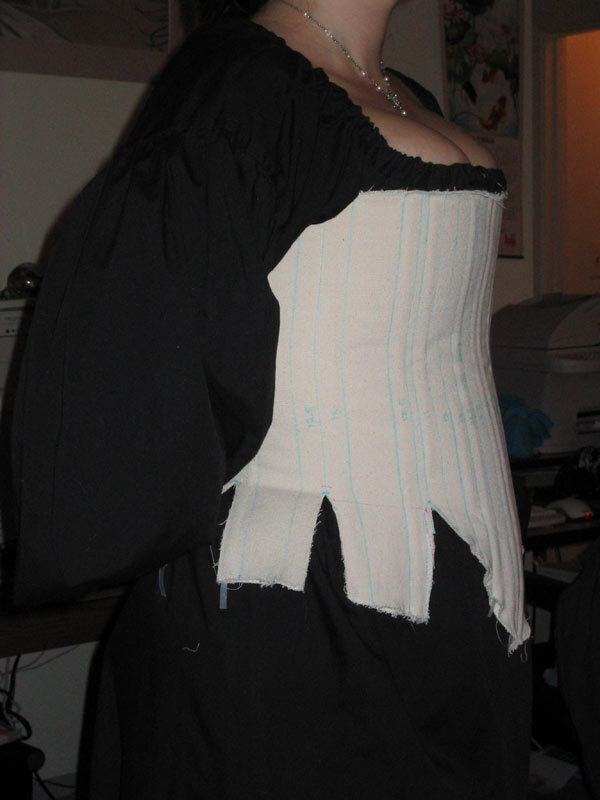 First the boning channels that I had to half cut off, then the temporary corset lacings (twice, cuz I tried it on twice). I also discovered the awesomeness of FrayCheck...Did wonders for cutting those tabs up higher when I didn't have the energy to sew a cleanfinish on the razzling demin. My corset frontview. Notice the side tabs sticking out. I will remedy this by cutting the tabs a little higher. They will also be more sturdy when I get my real boning (steel instead of poly). Sideview of my reworked corset. I like this line, and I think its period appropriate. And let me just tell you how weird it is for me to put such a buxom picture of myself online....Don't stare too much. My outer corset fabric is in the wash preshrinking--shoulda done that earlier, cuz I would be able to attach it tonight if I'd planned better. Oh well, I will add it to the design tomorrow, I'm sure. I feel so productive! And in other news....I've ordered the boning. I think I'm confident enough in the size of the corset that I can do it. Anyway, the prices really were not bad. The best prices I found were at Hedgehog Handworks. They also give discounts when you order in quanties of 4 or more, and everywhere else I looked only gave quantity discounts for 12 or more. I ordered some extras too, just in case--I probably will want ot throw a few into my gown, too, so why not? 1) The front 4 channels with 1/2 inch spring steel, which I read can bend forward and back but not really side to side (which means sturdier "busk" effect). I'm also doing the 2 back center bones with spring steel (but 1/4 inch), as I read somewhere that it was "must" for corset integrity. 2) The channels around the tabs will have 1/2 inch spiral steel, as this can bend side to side (important to have on your...ahem...sides). But also they are sturdier than poly, and I don't want my tabs flipping up. Hopefully that works. 3) A few non-important channels will have poly boning for some support. Mainly, these are the ones that are sandwiched safely between channels of steel--A way to save a little money.